The Women's Singi Fleece Hoodie is a comfortable and durable jacket made from lovely thick recycled polyester fleece fabric. 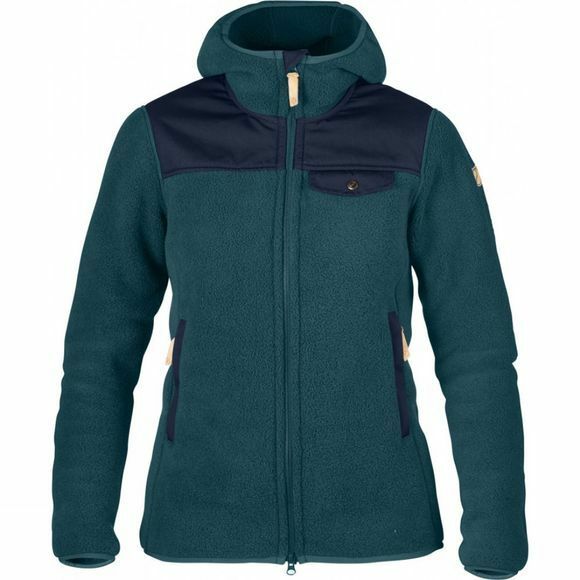 It is perfect as a warm mid layer under a shell jacket, as the fleece's high loft traps a lot of insulating air. Reinforcements in G-1000 Eco make it extra durable in exposed areas: over the yoke where pack straps rest, around the pocket openings and on the elbows. A well-fitting hood comfortably warms your neck and head and there are two hand pockets with zips. The front zip is two way, making it possible to ventilate from both ends, and has a protective flap in G-1000 Eco on the inside.